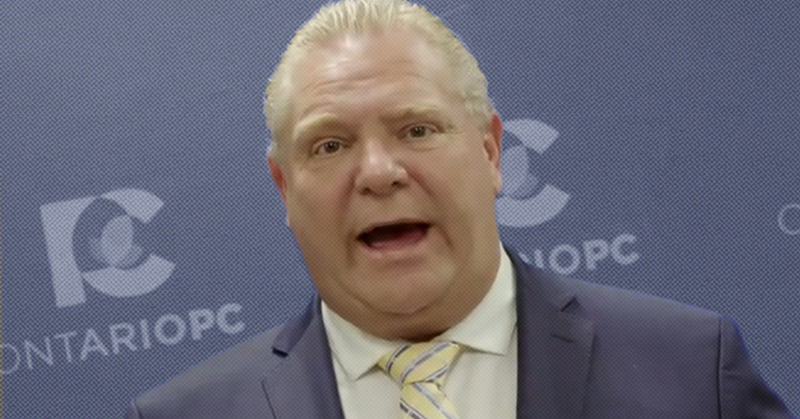 Doug Ford would like Ontario’s struggling workers to believe “relief is on its way” – too bad the Ontario PC leader’s plan will leave those “folks” in much worse shape than they already are. 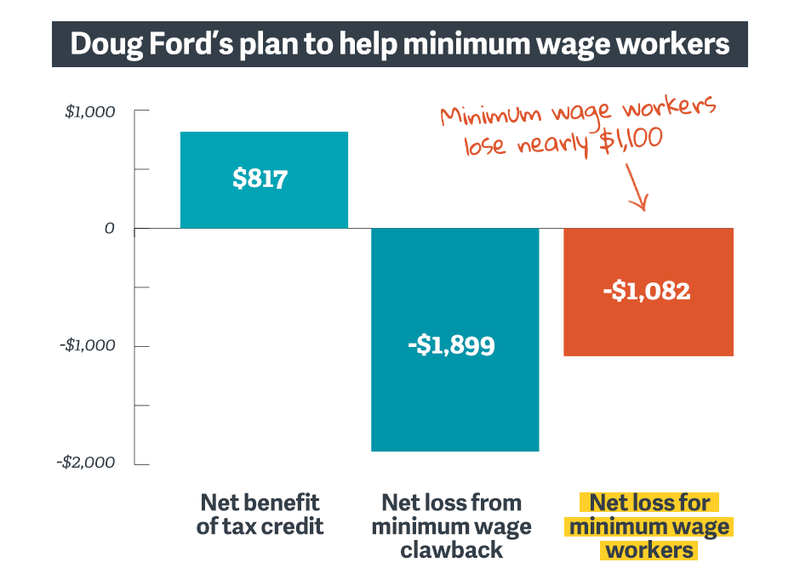 Just look at his own numbers: everybody who has done the math concludes Ford’s plan to help “folks that are working their back off for minimum wage” will actually take $1,100 out of the pockets of minimum wage workers. Meanwhile, Ford is promising corporations big tax cuts even though corporate taxes are already at a historic lows and corporate profits are reaching historic heights. 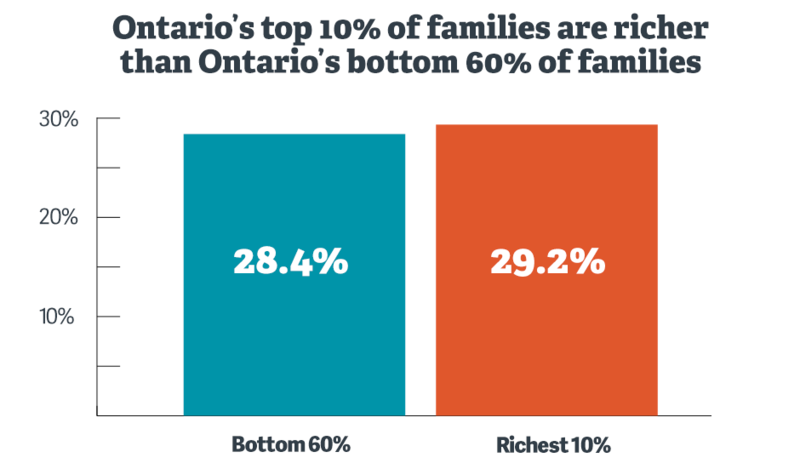 Ford’s policies won’t just fail to give workers “relief” – Ford’s economic plans would accelerate the forces that have been driving inequality in Ontario for decades. For one thing, Ford’s plan to take money out of workers pockets and give tax cuts for corporations would do nothing for workers in blue collar towns across Ontario. Even as taxes were cut again and again, the province lost nearly one million manufacturing jobs between 2004 and 2012, replacing good-paying, middle-class jobs with lower-paying, less secure retail and service sector jobs, hollowing out small towns and forcing residents to take lower-paying service sector jobs or move in search of work. Although some call Southwest Ontario “the new rustbelt,” the same forces driving low-wage work is happening in Ontario’s big cities too – a 2016 study published by the Canadian Centre for Policy Alternatives found inequality is transforming neighbourhoods and cities across Ontario. The CCPA study noted cities like Toronto and Ottawa are increasingly divided between white collar urban professionals and a new “working poor” made up of core and service sector workers who tend to live in the suburbs where costs of living are nominally lower, although they face added costs due to barriers like transportation or lack of access to public services. Although they may work up to 40 hours per week, many retail and service sector workers in Ontario still have a lot of trouble making ends meet. For those low-wage workers, not only will Ford take a thousand dollars out of their pockets, but his campaign promises suggest he’ll need to cut up to $25 billion from public services all while doing nothing meaningful to help those struggling with costs for things like prescription drugs, dental care or transportation. Meanwhile, big corporations get billions in tax cuts? From big cities to suburbs to small blue collar towns, it looks like Doug Ford’s got a plan to increase the gap between rich and poor while doing nothing to address the real struggles facing Ontario’s workers. How hard is it to make ends meet these days? Doug Ford is railing against Kathleen Wynne’s secret backroom deals while privately promising wealthy real estate tycoons he will green light a plan to bulldoze environmentally-protected public lands. 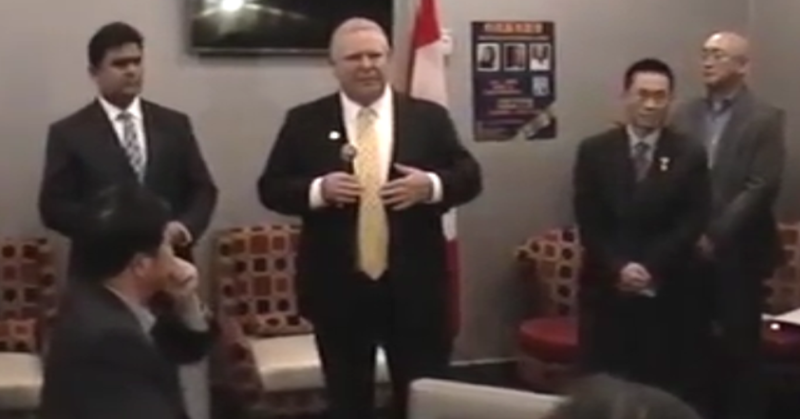 In a newly surfaced video filmed February 12 at a campaign event in Markham, Ontario, Ford says he’s talked with “some of the biggest developers” in Canada about developing a “big chunk” of Toronto’s greenbelt.